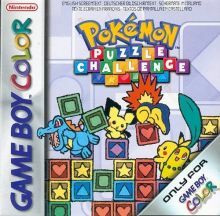 Pokémon Puzzle Challenge, known in Japan as Pokémon de Panepon, was a GameBoy Color game based upon the classic puzzle series Panel de Pon. This game has you connect various different styles of blocks to remove them from the field of play. These get scrolled upwards giving you more options until you hit the top and lose. However, it has a Pokémon twist. In the game, you're often playing against a computer player and whenever you make a combination, you send an attack to the other player which adds several lines. The game has multiple modes. First is the story mode, which has you select a Pokémon and travel through Johto, defeating Gym Leaders and Elite Four members as you go. Marathon mode which is endless until your lose. A Score Attack mode, a special mode where you get given a certain puzzle you need to clear and a mode where you have to remove all the attack blocks. It also has multiplayer through the GameBoy's link cable. There are several Pokémon to collect within this game, including eggs that hatch when you reach certain unlock points in the various modes.